Welcome to Week 11. We are now officially in the heart of the Christmas season! 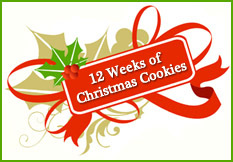 What a wonderful collection of cookies we've had and we are finally on the next to last week! Sometimes there is nothing better than a big, fat, slice of Red Velvet Cake. And the best part is the CREAM CHEESE FROSTING. So why not in a cookie?!?!? I've had this recipe bookmarked for the entire time we've been baking cookies and the planets, stars, the good Lord's intervention whatever you want to call it has finally come together that I have all the ingredients in my house to finally make these cookies. 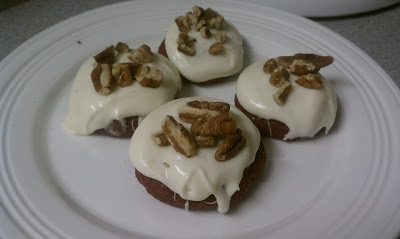 I really wanted to send these to my friend Brian, as his birthday was last week and he loves red velvet cake, but the girls at work got them instead because I was afraid of what would happen with the cream cheese frosting! P.S. Don't forget to enter my giveaway! It ends Saturday! In large bowl, stir cookie mix, cocoa, butter, sour cream, food color and egg until soft dough forms.The dough will be very thick. Roll cookie dough into 1-inch balls and place 2 inches apart on an ungreased cookie sheet. Bake 8 to 9 minutes or until set. Cool a few minutes and remove from cookie sheet to a wire rack. Cool completely (about 15 minutes). Combine cream cheese and butter until well combined for frosting. Slowly add confectioners sugar and milk. Beat until well combined. Frost cooled cookies with cream cheese frosting. Sprinkle with chopped pecans and store tightly covered at room temperature.